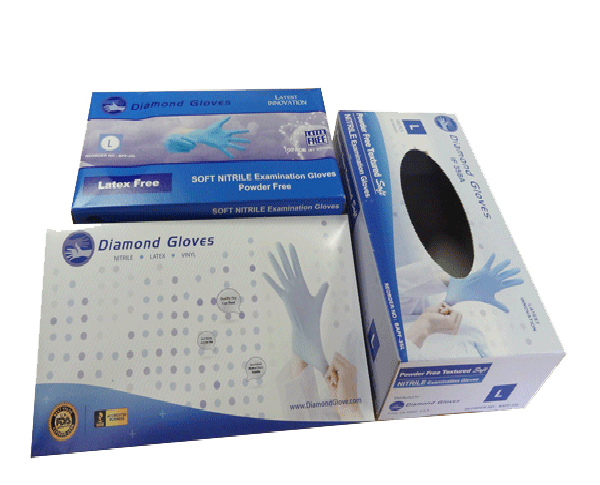 Whether reusable or disposable, keep your gloves products securely and neatly packaged in our custom printed glove boxes at Business Image Printing. With Business Image Printing, a specialized medical glove boxes printer, you can create your own custom printed glove boxes that can store your products neatly and with style. All there is to do is give us a call and our team of trained professionals will happily discuss with you any and all of your personal designs you may have in mind for your custom printed packaging. Featuring a large variety of stylish pre-made box templates in addition to a wide selection of additional features, there’s tons of options for you to choose from for your custom packaging. Alongside being able to create any design you want, you can also print your own graphics, messages… you want as well from company logos to any unique patterns you’d like people to recognize your product by, virtually anything you want to print all at cost-friendly prices and speedy turnarounds. With an experienced team that knows what they’re doing and a set of advanced technology specifically built to get the best results in printing, everything you need to design and create the perfect custom printed glove box is right here at Business Image Printing. For more information regarding any special additional features such as spot UV coating, hot stamp foiling, or embossing, feel free to contact us for more details.